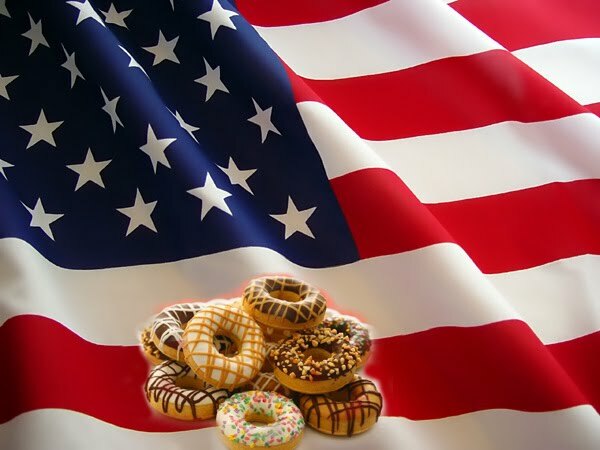 The Donut Directory: Happy Fourth of July! What would the 4th of July be with our the good ole Red, White and Blue, the colors that signify all that make this country great! Therefore, in keeping with the spirit of our national symbol and the focus of the Donut Directory, I'm giving you a recipe to combine both. Mix together the dry ingredients in a bowl. Beat and add the eggs. Mix together. Add the milk a bit at a time until your mixture forms a dough. Place a pan of oil* on a medium heat and allow to warm through. Drop in your donuts two at a time (or 4 small ones) and fry for about 3 minutes for the small, 5 minutes for large (until they are risen and golden brown), then place on kitchen paper to drain. * The cooking should always be done by an adult. Children should never be left unsupervised in the kitchen, especially around hot oil. You don't need to stick to traditional donut shapes! 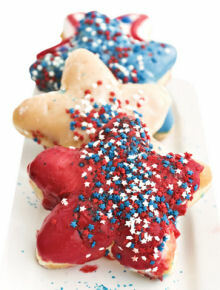 Try some 4th of July donuts by shaping the dough with cookie cutters and glazing with an icing sugar (confectioners' sugar) and water mixture, colored with food coloring and topped quickly with some appropriate sprinkles! Air Jordan 4 pas cher Cette action air jordan executive femme vise à éviter le terme dans la nouvelle nike air huarache basket loi sur le contrat de travail: nike air max bw pas cher pour homme - 1. Le système Nike Tuned asics gel lyte v noir homme Air se compose de deux hémisphères basket new balance femme pas cher en polymère opposés qui rebondissent nike air max 1 bleu marine homme l'un contre l'autre pour absorber les chocs.